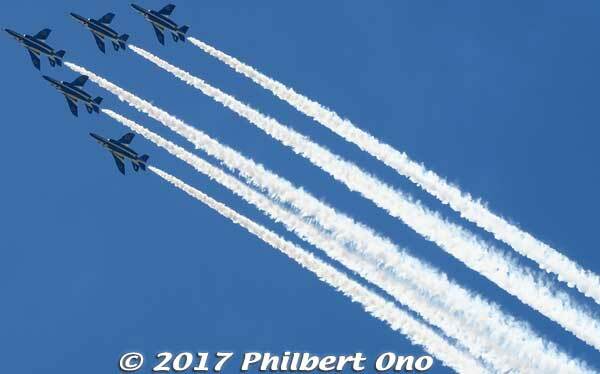 Japan’s aerobatic team called Blue Impulse performed today over the city of Hikone to celebrate Hikone Castle’s 410th anniversary. 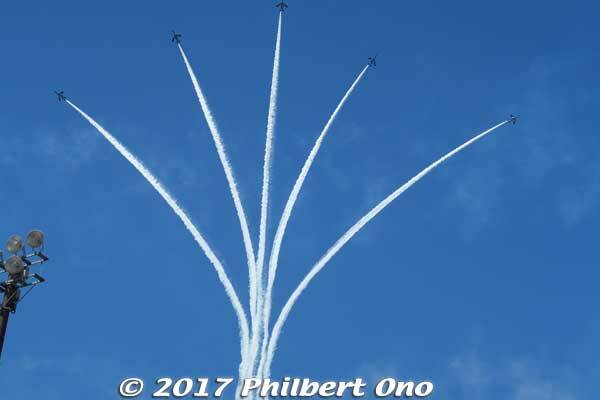 Based at Matsushima Air Base in Miyagi Prefecture, Blue Impulse performs all over Japan from April to Dec. But this is the first time for them to perform over Shiga Prefecture. They passed out free uchiwa fans while they lasted. 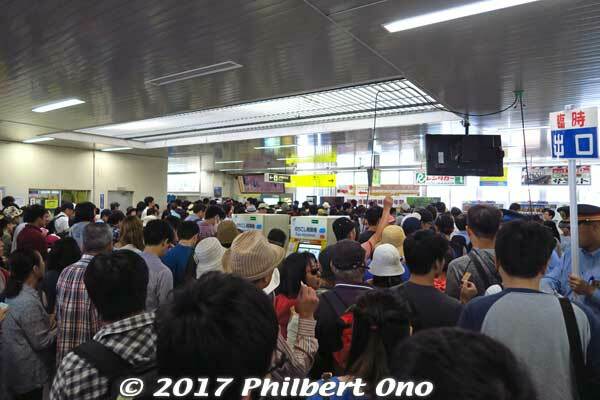 Today at JR Hikone Station. Jam-packed from 11 am. 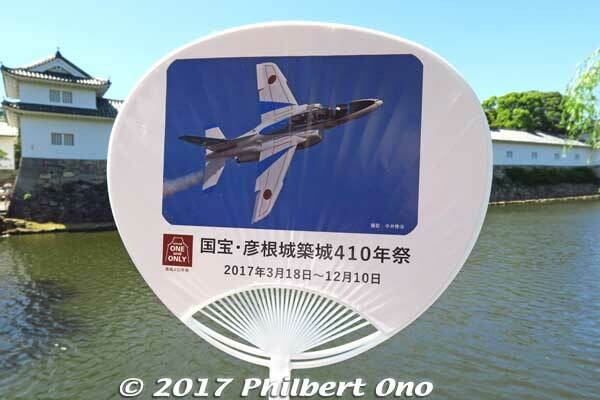 Blue Impulse planes were scheduled to fly at 1 pm for about 20 min. 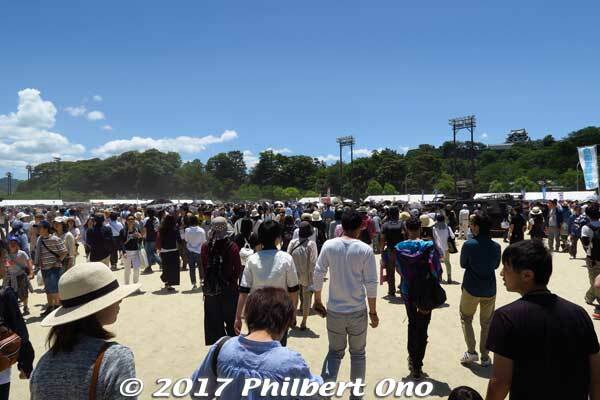 They herded the crowd to Konki Park near the castle and the main venue where they had a stage and food booths. Lines for food were ridiculously long. Dusty too. Great that the park still had a view of the castle (toward the right). 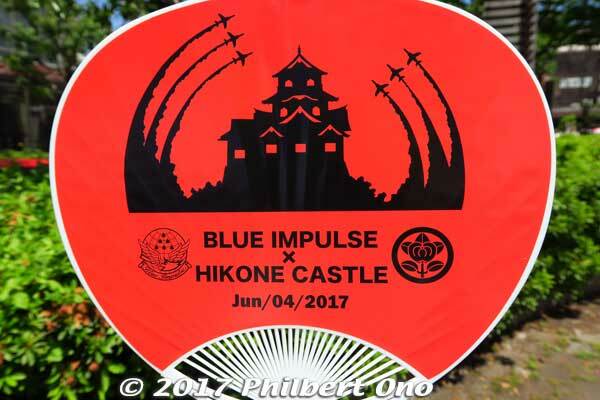 While everyone was looking straight ahead at the castle, the planes came from our right, from Lake Biwa. Very dramatic. I was shooting video at the same time. 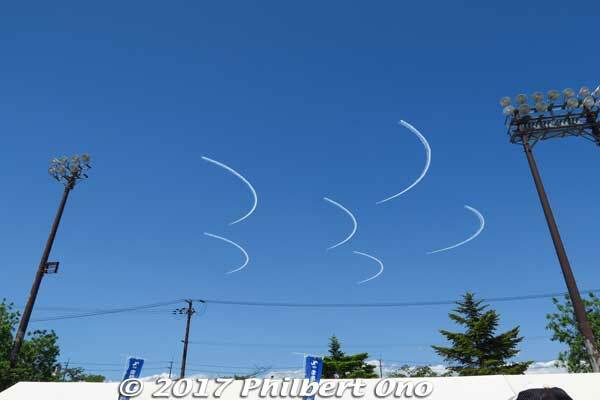 There were six planes. 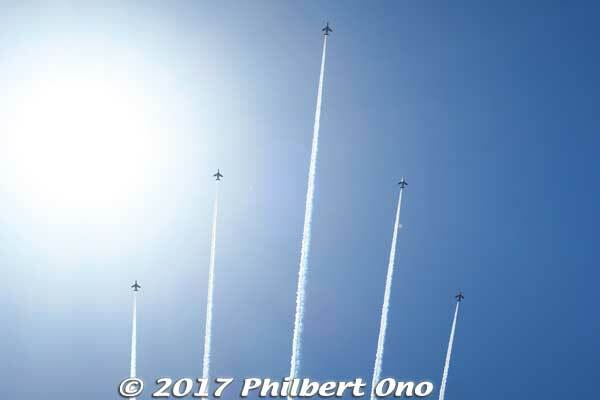 They flew across the sky a few times in various formations, each one explained by a narrator who was a pilot himself. Sakura cherry blossom, although the season has passed. 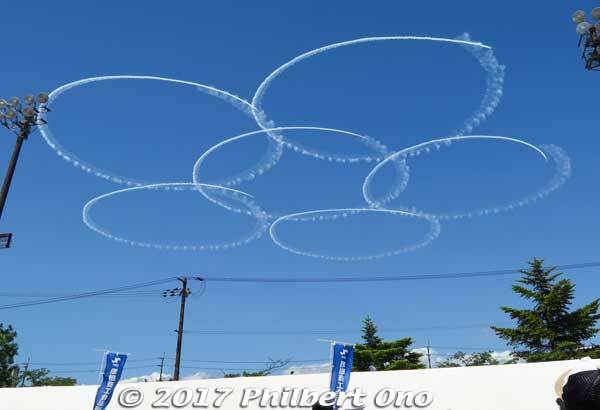 Two planes also drew a heart in the sky. The only shot I got with the castle and planes together. This was when they were finished performing and were leaving. Crowd going home. 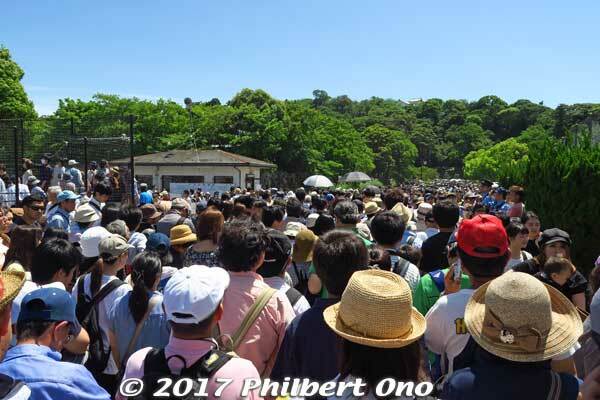 Hikone probably has never seen so many people. 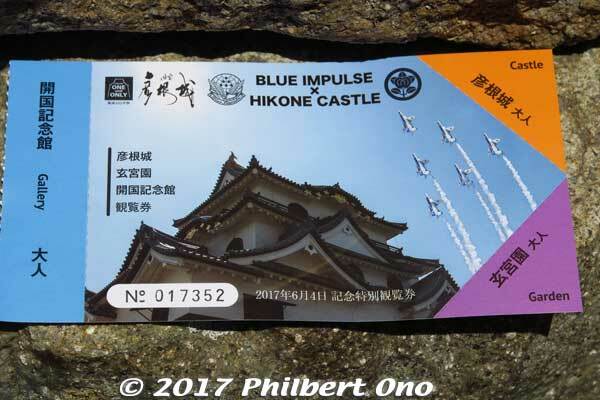 Special edition castle admission ticket printed just for today. June 3 at Genkyuen Garden. 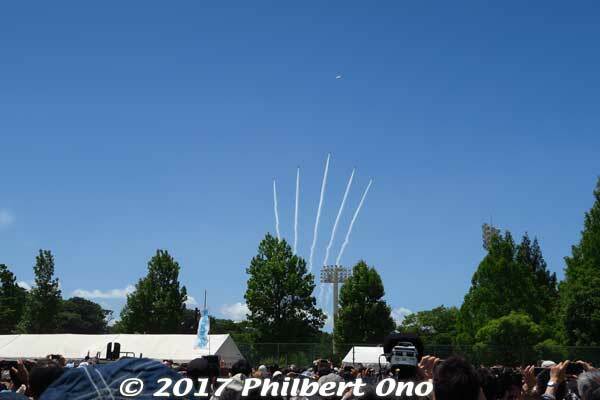 Blue Impulse also performed yesterday (June 3) to practice. Went to see that too. 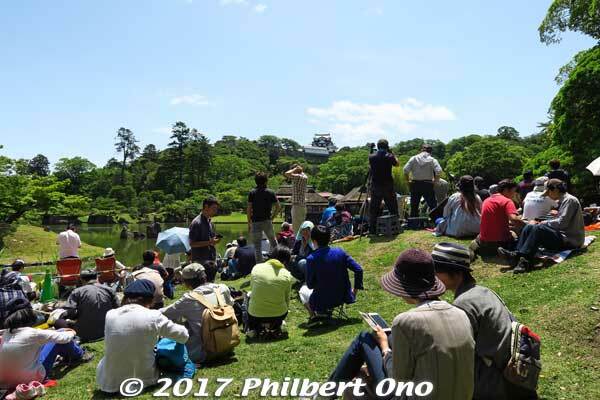 Here we are yesterday at Genkyuen Garden next to the castle. 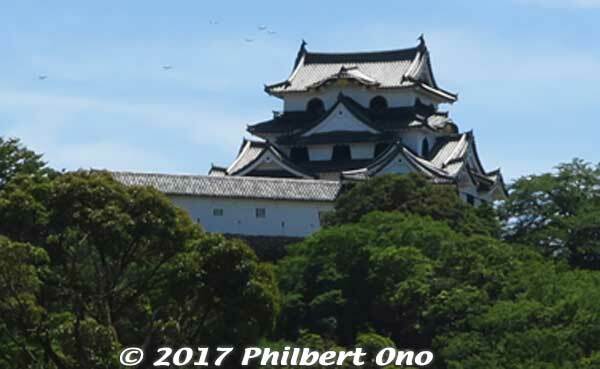 I and many others thought that this was the best spot to photograph/film the planes flying over the castle. We were dead wrong. The planes flew behind us instead and never really flew next to the castle from our viewpoint. We had to go to the opposite side of the garden. 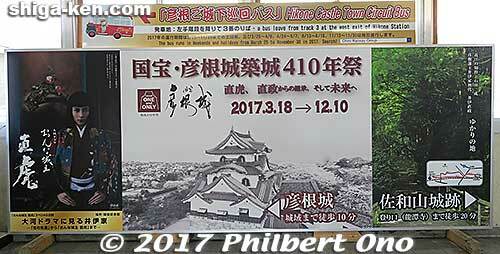 Hikone Castle’s 410th anniversary was mainly celebrated with special exhibitions in a few castle buildings from March 18 to Dec. 10, 2017. More details here.